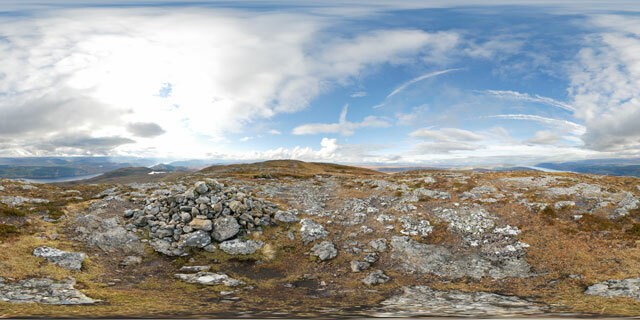 360° VR panorama of a minor summit of Meall Fuar-mhonaidh, near Loch Ness, Scotland. The minor summit is topped with a cairn, the true summit can be seen further to the west, topped with another cairn. The hill is classed as a Graham, with the highest point reaching a height of 699 metres above sea level. Meall Fuar-mhonaidh is the most prominent summit around Loch Ness and provides excellent views along the Great Glen. On a good day Ben Nevis can be seen from the summit.